Take a tour, accompanied by curious sheep and geese, of Mark Cooper’s self-sufficient small farm. 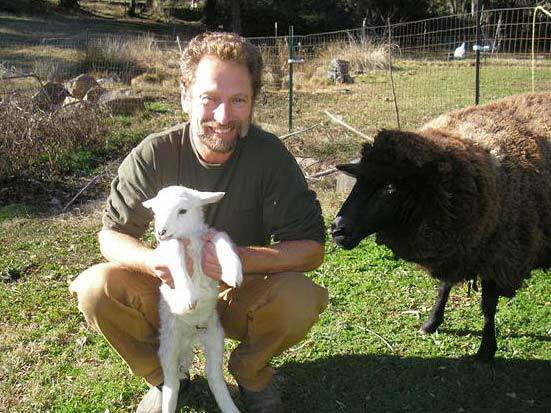 Over several years, he transformed a rundown house and hillsides of berry brambles into pasture and gardens where he produces and preserves most of his family’s food. Visit the Goose Grotto in a constructed pond, a heritage fruit tree orchard, logs producing shiitake mushrooms, and a cheap-and-easy container kitchen garden. Mark gives us a close-up view of the solar dehydrator he constructed from salvaged materials — and his tips on food drying. He has husbanded up to fifty animals at a time, including two Tibetan yaks! This farmstead in Rough and Ready (CA) lives up to the town’s name — and is a testament to hard work, wide-ranging construction skills, and love. another really great interview with loots of info and how to’s. Is it OK with you if I show it at my local Community harvest/ Permie meetings?